We have become known in the industry for providing the best rod protection with our product line of Rod Glove's but we also offer protection for your reels. As angler's, our biggest investment is the rods and reels that we use either competitively or for recreational fishing. The Reel Glove is offered in both spinning and casting and will protect your reels while travelling or while in storage. Whether you are a competitive tournament angler, recreation angler or traveller, the Rod Glove provides a solution to keep your reels protected. The Reel Glove is a high quality neoprene protective cover that fits on most bait casters or spinning reels. 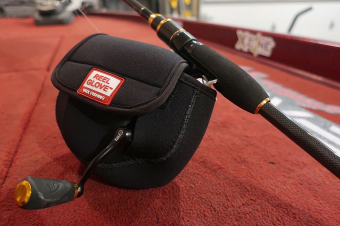 If you are travelling with a rod and reel for spring break, why not protect your investment with the Reel Glove to keep it from getting banged around during travel. Designed to fit most common sizes of reels, the Spinning Reel Glove fastens to your rod with a velcro closure, and fits up to 3000 series spinning reel. This durable stretch neoprene also fits 50,100, 200 and 300 Series Low Profile Casting Reels. Pick up a Reel Glove today! I use The Rod Glove products to protect my gear, my rods and reels. Because I like to take care of my stuff and because they are expensive. I trust in The Rod Glove products to protect my loving rods and reels.